Ninja Coffee Bar vs Keurig two of the best well known brands in home brewing. Which one however is going to give you that perfect hit of caffeine first thing in the morning or that essential pick me up mid-afternoon? Nothing beats the smell of fresh coffee whether it's brewed slowly in a carafe or a quick hit from a pod, if you are going to the trouble of making coffee then make it perfect! One thing is for sure if you are going to buy a coffee maker then it better deliver! Keurig over the past decade has cemented itself firmly in the home coffee brewing market. Within North America it is the out and out leader of the pack for pod style coffee makers. The only other brand that has come close to Keurig is Nespresso and that has most of it's market share in Europe. Pod style coffee makers give you all of the flavor of espresso without the mess and maintenance of a full sized espresso maker. ​The Ninja Coffee Bar however, is more a coffee house on your countertop. It accepts ground coffee only so does lack the speed and convenience of a pod type coffee maker. The Ninja Coffee Bar is a all-in-one type brew station. ​Unlike the Keurig the Ninja cannot accept any pods, so it is based entirely on ground coffee. The coffee is placed in a standard filter basket that you would find on any drip coffee maker. ​It has fifty ounce reservoir which is considerably smaller than the K575's eighty ounces. Ninja's "Auto-IQ One-Touch" enables the brewer to only draw the exact amount of water from the reservoir depending on which of the sizes you choose. You can choose one of four sizes cup, travel mug, half carafe and full carafe. The carafe holds ​forty three ounces and is made from stainless steel. It is also thermally insulated so should help to keep your brew warm for a few hours. Classic - The classic type gives you the traditional drip coffee. Rich - The rich setting will brew a stronger cup than the standard classic. Over-Ice - This setting is for producing coffee concentrate that can be used in iced beverages. Specialty - This brew type is for brewing an espresso like concentrate. Included with the brewer are a forty page specialty drinks recipe book and a reusable permanent filter. ​Looking for one of the most popular pod style brewers ? The look no further the K575 is the top of the range brewer available from Keurig. ​The K575 from Keurig is a pod only type coffee maker. Using the pod system it can brew a coffee in around a minute from start to finish. If brewing a larger carafe style coffee then it takes roughly three minutes. The K-Cup range of coffees include a selection of different coffees from well known coffee brands so there easily something for just about anybody.​ A massive list of different strengths and types of coffee are available in varying sized pods. The Keurig K575 has an eighty ounce reservoir and has the ability to brew eleven different sizes depending on the pods used. Looking for a programmable coffee maker with the added convenience of pods, then the K575 is a sure winner.​ Not only can it make great espresso style coffee but it also makes a fine carafe of your favorite brew for when you feel like sharing. 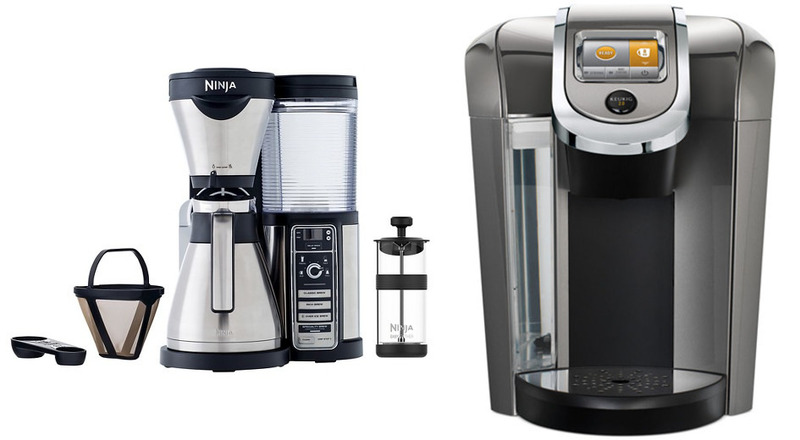 Ninja Coffee Bar vs Keurig which should you choose ? Ultimately the decision will come down to drip coffee versus pods. ​If you are old fashioned and have grown up with the more traditional style of coffee found in diners and homes across the country then the Ninja is a save bet. The Ninja is also a lot more versatile. It can brew many different type of coffee and even comes with a built in frother whereas the K575 is limited to coffee only. However if you want the no mess pod system then the Keurig K575 is one of the best pod based coffee makers available. With a massive range of flavors and strengths available the K575 is hard to beat. The pods also have the added advantage of being easy to store and last a lot longer over loose ground coffee that needs to be used quickly to retain its flavor.